Reliance Retail’s Lyf branded smartphones have now been listed by the company’s online store ahead of an official announcement. Reliance Digital has listed the Lyf Earth 1 (seen above), Water 1, and Water 2 smartphones with pricing details. Unfortunately, there is no word on the availability of the handsets as of now. The Lyf Earth 1, which was revealed by the company earlier this month, has been listed at Rs. 23,990. The Lyf Water 1 has been priced at Rs. 14,999 and Lyf Water 2 at Rs. 14,690. A report earlier this weekclaimed that Reliance’s much-anticipated Lyf series of smartphones would go on sale in the first week of February and will be available in at least 13 cities. For specifications, the Lyf Water 1 (seen above) and Lyf Water 2 smartphones come with a lot of similar innards such as both feature 5-inch LCD display; 1.5GHz octa-core Qualcomm Snapdragon 615 (MSM8939); 2GB of RAM; 16GB of storage, and expandable storage support via microSD card (up to 32GB). Both the handsets sport 13-megapixel rear as well as 5-megapixel front-facing cameras. Both dual-SIM smartphones support 4G LTE bands in India. Connectivity options include GPRS/ EDGE, GPS, 3G, Bluetooth, Wi-Fi, and Micro-USB. There are few differences as well as Water 2 sports HD (720×1280 pixels) screen resolution while the Water 1 sports full-HD (1080×1920 pixels) screen resolution. The Lyf Water 1 runs Android 5.1.1 Lollipop out-of-the-box. The Lyf Water 2, on the other hand, runs Android 5.0.2 Lollipop. The Water 1 packs a 2600mAh battery while the Water 2 packs 2400mAh battery. According to the Reliance Digital listing, the Water 2 (seen above) packs a 7.7mm unibody design and sport dual tone silver matte finish. The 135 gram device is also listed to include “retina scan access”; though there are no further details about the feature. The 6.8mm measuring Water 1 smartphone sports unibody design with dual glass finish. The handset sport LED flash on both front and rear panels. 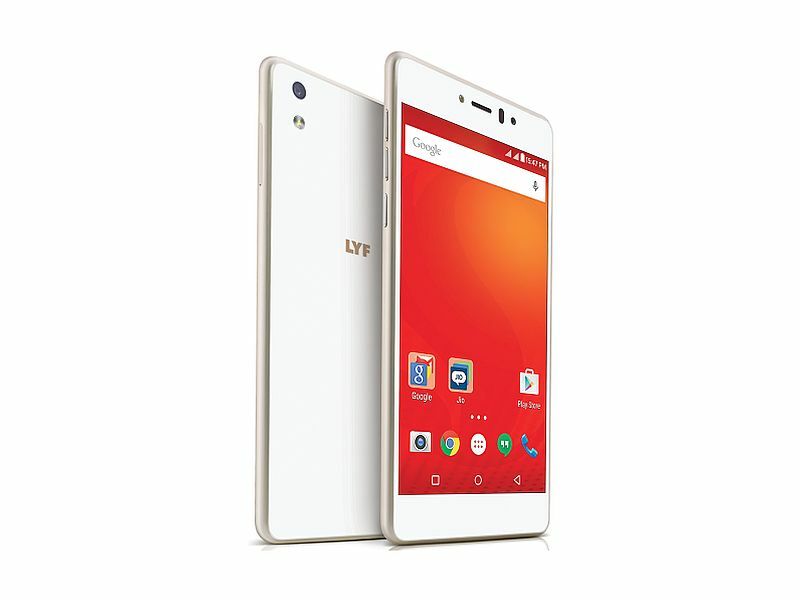 Lastly, the Lyf Earth 1, as reported earlier, features a 5.5-inch full-HD (1080×1920 pixels) AMOLED display. Much like the Water 1 and Water 2 smartphones, the Earth 1 also packs octa-core Qualcomm Snapdragon 615 (MSM8939) processor clocked at 1.5GHz clubbed with 3GB of RAM. The handset packs 32GB of storage and supports an additional 32GB of storage via microSD card. The Earth 1 smartphone sports dual rear cameras, with one 13-megapixel sensor and one 2-megapixel sensor. It also packs a 5-megapixel front-facing camera. Connectivity options include 4G LTE, Wi-Fi 802.11 b/g/n, Bluetooth 4.0, and GPS. The Android 5.1.1 Lollipop-based Lyf Earth 1 runs on a 3500mAh battery. Weighing 162.5 grams, it measures in at 154×76.6×7.25mm.